Validating Preventive Food Safety and Quality Controls: An Organizational Approach to System Design and Implementation is a how-to-guide for food industry personnel providing essential preventative control system guidance to help design and implement scientifically verifiable food safety controls in food processes. 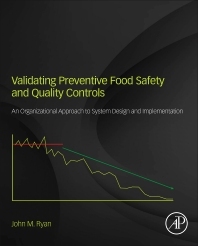 This reference includes proven tools and techniques to move positively towards the validating preventive control challenges that the food industry is facing, and helps implement compliance strategies to adhere to the food safety and modernization act requirements. Dr. John Ryan was the Administrator for the Hawaii State Department of Agriculture's Quality Assurance Division. He was responsible for developing food safety and traceability systems within the state of Hawaii. Dr. Ryan piloted the USA's first farm-to-fork award winning internet-enabled RFID food traceability system and one of America's early high-technology sensor based temperature control supply chain food safety system. He has recently worked with a number of international companies to establish real-time international food traceability that reports trans-Pacific transportation temperatures and tests for bacteria, explosives and container tampering. He spent two years as co-team leader for President Obama's FDA/CDC Information Technology team and also served on the FDA Performance Management and Standards Developments team. He is the president of Ryan Systems, located in Canyon Lake, CA.